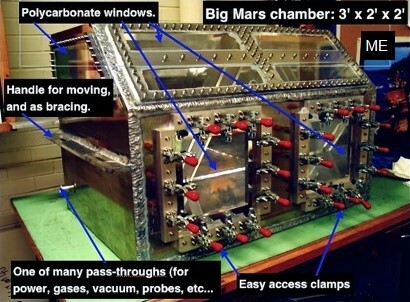 The large-capacity Mars environment chamber (big-ME) which enables exposure of multiple samples, large samples, or instrumentation, to Mars-like surface conditions. In order to improve our ability to map the surficial geology of Mars and aid in the search for habitable environments and signs of past or present life, the PSF has constructed a large-capacity (~0.8 m3) environment chamber that allows for exposure of samples or instrumentation to Mars-like surface conditions of atmospheric pressure and composition and UV irradiation for extended periods of time. The chamber can be interfaced with various spectrometers. In terms of geological mapping, this facility is being used to examine the stability and spectral behaviour of water-bearing minerals that may be present on Mars. Cloutis, E.A., M.A. Craig, J.F. Mustard, R.V. Kruzelecky, W.R. Jamroz, A. Scott, D.L. Bish, F. Poulet, J.-P. Bibring, and P.L. King (2007) Stability of hydrated minerals on Mars. Geophysical Research Letters, 34, L20202, doi:10.1029/2007/GL031267, 2007. Cloutis, E.A., M.A. Craig, R.V. Kruzelecky, W.R. Jamroz, A. Scott, F.C. Hawthorne, and S.A. Mertzman (2008) Spectral reflectance properties of minerals exposed to simulated Mars surface conditions. Icarus , 195, 140-168. Wang, A., J.F. Bell III, R. Li, J.R. Johnson, W.H. Farrand, E.A. Cloutis, R.E. Arvidson, L. Crumpler, S.W. Squyres, S.M. McLennan, K.E. Herkenhoff, S.W. Ruff, A.T. Knudson, W. Chen, and R. Greenberger (2008) Light-toned salty soils and coexisting Sirich species discovered by the Mars Exploration Rover Spirit in Columbia Hills. Journal of Geophysical Research, 113, E12S40, doi:10.1029/2008JE003126, 2008.